An eight foot tall obelisk, laying on the ground, is discussed as a geology problem, an artistic problem and a excavation and logistics problem. Acting as living scaffolding the students will raise the obelisk to a standing position, discussing its weight and mass, its height and shape all in regard to the engineering problems posed in its construction. The Transport Station provides a series of logistical problems of moving a large stone overland, from the dig site to the river bank, and ultimately onto a barge for river transport. As a sand and water exercise, they experiment with the options available to the Egyptians of the period, and compare the engineering options available to the French in 1800. The culminating obelisk station demonstrates the final raising effort onto a pedestal using the sand removal method. Students build an embankment, fill it with faux sand, and using geometric calculations, position blocks at 75 degree angles to insure the proper raising technique. The entire class gets to observe the fifteen pound stone obelisk settle into the pedestal groove and come erect by the careful teamwork of the erecting crew. The direction Finding and Site location station has the students find true north and the cardinal directions using the Egyptian star method. They line up the building site with the four directions, N, S, E, W, and commence preparing the 'ground' for construction of a Pyramid. Using water levels, they clear the ground of obstructions and level the stones and sand throughout the 2' x 4' container. A second crew of student builders, lays flat slabs of stone onto the construction bed using levels and hand tools. Their efforts must produce a correctly positioned, flat, and level surface on which the next crew will work. A third crew will initiate the actual Pyramid foundation platform, laying sixteen odd sized blocks into a predetermined shape. This will be the bed onto which the Pyramid blocks will be placed. The fourth team will assemble a single side of the Great Pyramid, following the directions of a task booklet which instructs them in the manner of assembling each level. Their object is to create a uniform, tight fitting side of the pyramid and finish the white blocks with a golden cap stone. In order to raise the heavy granite blocks from tier to tier, the Egyptians used mobile lifting engines which were compound seesaws. 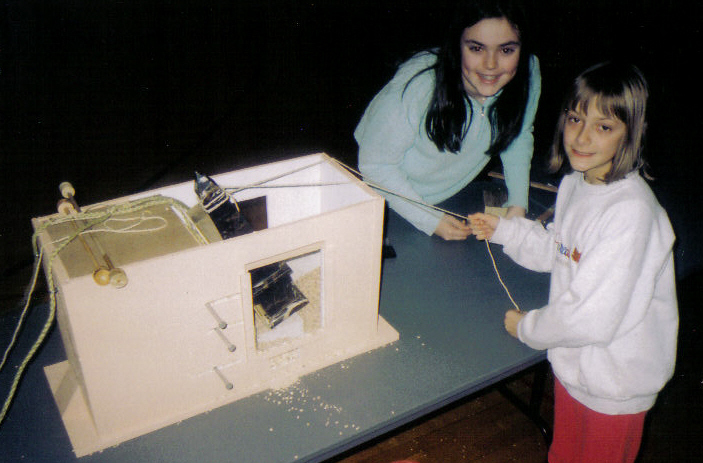 A table sized model will be built by one team using a task booklet as a guide. The completed project will demonstrate how a block was raised to a height and shifted into position and onto a sled for movement. A full size model of the complex fulcrum is available to be built after the smaller model is demonstrated. Once erected it is capable of lifting a large 3' x 3' block or several teachers off the ground to a height of five feet. Lots of giggles here. An optional Archeology task incorporates the use of maps and tools to locate a dig site of opportunity. Students pick, choose, or dismiss points on a map after trial and error ventures 'into the sand' reveal either something of worth or noting at all. A mystery sand box is carefully explored removing layer by layer of sand until a man-made stone cover is revealed. What treasure or heart wrenching frustration lies beneath? Dig and Discover! A stairway and possible royal tomb? Maybe. The first burial sites of importance to historians, anthropologists, and archaeologists were known as 'basket burial'. This station provides the fundamentals of such a burial with all the important remains, as a prelude to working with mummies. 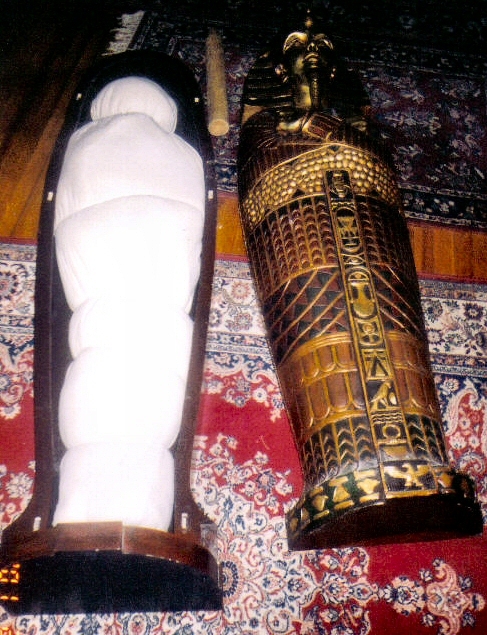 The mummy station allows the students to both un-wrap a 'found' mummy, and prepare, by wrapping a newly prepared deceased. Made of colored and sewn cloth, there are internal body parts which must be dealt with, such as twenty feet of intestine, a heart, lungs, stomach, liver, kidneys,….what to do with all this stuff? Kids love this station. The Block station gives our young engineers an opportunity to consider how heavy stones were moved up and down hills and overland by providing a three foot cube, a sled, rope, and roller logs. Our physics discussion talks about motive force, mass, inertia, conservation of mass and energy, angles of attack and the application of relative forces like gravity, mass, drag, etc. Can four teachers weight be easily pulled along to corridors? Grab a rope and a log and see. A language station allows for observation of a replica Rosetta Stone and hieroglyph reproduction. Students can learn the Egyptian alphabet and write their names with ink blocks on cartouche frames. As a live water exercise, the Shaduf station requires building a model of an ancient water lifting device and figuring out how much effort and time is needed to raise water from the river to the fields, to irrigate the crops. The students will build the model, measure the water lifted over two minutes, calculate the total volume, and translate the volume lifted in an hour to that lifted in a days work. The simple math goes on to challenge them with many questions about the efficiency to this irrigation method.